Did you know the Band-Aid® was originally invented as a way to help a clumsy woman dress her own wounds? Did you know they almost never made it to market? Earle Dickson was born in Tennessee on October 10, 1892. He graduated Yale University in 1913 and took on work as a cotton buyer for Johnson & Johnson in 1915. Two years later he married Josephine Knight, the woman who would inspire him in ways he had not yet imagined. You see, Earle’s doting young wife was – as legend has it – as accident-prone as she was kind. Josephine had a knack for knicks and burns from working in the kitchen, and it was not uncommon to come home and find his wife’s hands covered in bulky bandages. Not only where they difficult to manage and easily undone, they also where nearly impossible to apply alone. It was this struggle to help his wife apply and reapply her bandages that the young Mr. Dickson arrived at his ingenious idea:He placed pieces of gauze at regular intervals on an adhesive strip and covered them with crinoline to keep them sterile. Brilliant! Now all sweet Josephine had to do was cut off a piece of the strip and wrap it around her cut – on her own. Thrilled at the personal success of his invention, Earle Dickson brought the concept to his bosses at Johnson and Johnson. …they were not impressed. Not at first, anyway. It was only when Dickson showed them how very easy it was to apply a bandage to himself, by himself that the men started to see real potential for the new product. 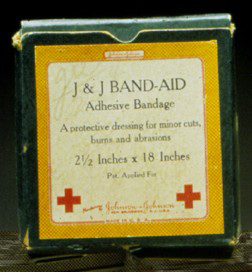 Not long after, the first Band-Aid was made and sold to the consumer market. This early version was 3″ long, 18″ wide, and was hand made. It was not particularly popular: only $3,000 worth of product was sold in the first year. But by 1924, Johnson & Johnson had started manufacturing the product on machine, and sales began to take off after Johnson and Johnson distributed free Band-Aids to Boy Scout troops across the country. 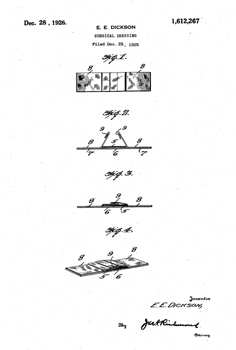 Earle Dickson was granted US Patent 1,612,267 for his invention on December 28, 1929. At the time of his death in 1961, sales of the Band-Aids had exceeded $30,000,000. Today, over 100 billion Band-Aid brand bandages have been produced, All thanks to a good husband who just wanted to help his clumsy wife. ← Hooks and Loops: Who Invented Velcro?